After my night out in Hue, and saved by the 2 am bahn mi trolley, I woke up EARLY to try to avoid the worst of the heat and humidity by getting to Hue’s Royal Citadel soon after it opened, so I could explore the massive complex in relative comfort. I should have just skipped sleeping all together and gone in the middle of the night . . . there was just no escaping the humidity in Hue! Nevertheless, I was at the citadel by about 8:30 am, after a short and cheap taxi ride across the Perfume River from my hotel. The complex is GIANT. As the only person from my tour who enjoyed the more cultural side of things, the one word I used to describe it to them was vast. At 10 km square, it took me three and a half hours to see most of the complex (I skipped the museum), and I was walking for almost all of that time. Did I mention it was about 37 degrees?? Thank God for my Camelbak! As I mentioned in my previous post, Hue was the capital city of Vietnam from 1802 – 1945, under the Nguyen dynasty. The Citadel contained the Purple Forbidden City, which housed the ruler, his wives and concubines, other members of his family and his advisors. The Citadel is surrounded by a moat and walls that are over 2m thick, and used to be home to hundreds of buildings of important cultural significance, but due to the Battle of Hue in 1968 during the Vietnam War, most were completely obliterated, and most of what still stands in the Imperial City today is a reconstruction. The breezeways of the citadel are impressive in their orna te decorations. Having not been to mainland Asia before, and not having much experience with the architectural styles there, I was constantly impressed by the level of decoration and detail of painting and colour. The red and gold was striking and vibrant, and it ordained all of the walk ways around the complex. I just wandered and wandered the complex, marveling at the buildings and the care and work that has gone into restoring them. The Citadel was almost completely destroyed by the Vietnam War, so restoration work is ongoing and time consuming. The restoration work never interfered with any of the sights in the Citadel, and the efforts of the restorers clearly worth it. See the small gallery below for more pictures of the Imperial City and Citadel of Hue. After a couple of days in Hoi An it was time to head further north, this time by bus, to the old Imperial City of Hue. Our journey started by taking us over the Dragon Bridge in Da Nang, past the marble mountains surrounding the city, and up a mountain full of switchbacks to Hai Van Pass, part of the Ho Chi Minh Trail. Let me state for the record that Vietnamese bus drivers are completely on par with Greek, Tanzanian and Mozambican bus drivers: insanely crazy. We survived the trip and enjoyed the amazing views that Hai Van Pass had to offer both north and south. It was at this point in the trip that I started to see the lush jungle vegetation that I’ve always associated with the Vietnam war. The kind you see in movies; thick, impassable and impossibly green. Arriving in Hue in time for lunch, I sought out my own meal, once again favouring a local meal over a more western style one with the group. I can eat tuna salad anywhere . . . I probably won’t have Banh Ram It ever again! After lunch, it was time for our motorbike tour of Hue and it’s surroundings. I really recommend taking a bike tour of Hue, as the city’s sights are spread far and wide around the country side. For about $15 USD, you can have a half-day tour of some of the royal tombs, a fancy bridge, and an old French bunker . . . all very worthwhile, but perhaps more importantly, by being on the bike you can escape, if only for a moment the oppressive, sticky humidity of Hue. I have lived in a LOT of hot sticky places, but Hue was by far the hottest, most humid place I have EVER been. I’m talking I drank SO much water/Pocari Sweat/electrolyte mix/juice/pop and STILL felt like I needed to consume more liquids to replenish the sweat that was pouring out of every pore. One would think that riding on the back of a scooter at high speeds in shorts and a t-shirt would be so low-entropy that it would keep the sweating at bay for perhaps more than two seconds upon dismounting said scooter. But oh no, that would be incorrect. As soon as the scooter reached any kind of speed less than 40 km/hr, the nearly unbearable humidity would again take hold, causing me to literally ring out my tshirt upon my return to my (thankfully air conditioned) room. We did see some pretty cool stuff on the back of the bikes, including a beautifully restored bridge not unlike the Japanese bridge in Hoi An. The Royal Tomb we visited was vast, with impressive grounds and temples throughout. It was being restored, still showing impressive scars from the Vietnam War, and the actual tomb itself was off-limits to visitors, only open to remaining members of the royal family on a single day each year when they are allowed to come and pay their respects. Next up was a bit of off-roading as our bike guides took us to an old French bunker that was built in the late 40s, used by the French against the Vietnamese, and then occupied by the Vietnamese and used against the Americans. Set atop a hill overlooking the Perfume River, one could see how it was a perfectly placed viewpoint, and in the now-peaceful countryside, offered stunning vistas. Halfway through our tour for the day, the dappled sunlight and light breeze made a perfect spot to take a group picture . . . even better was the view of our drivers taking a picture of us! Next up was a quick stop to see how the traditional conical hats and cinnamon incense were made. Both a highly skilled, repetitive and labour intensive process. I tried my hand at coating a stick with the sticky cinnamon incense, but will spare you the video of my uncoordinated attempts. Suffice it to say I need to stick to my day job! The last stop of the day was the Thien Mu temple, built overlooking the Perfume River over 400 years ago. At 7 stories high, it the tallest religious pagoda in the country, and each story represents a different Buddha. Behind the pagoda was a series of temples and courtyards, all beautifully manicured by the monks that still live there. The sun was setting and the shadows stretched long across the grass as we were leaving. A final scooter ride took back to our hotel for a much needed shower before we headed out for an evening of fun! Hue is randomly known for a club called Brown Eyes . . . apparently the #1 nightlife attraction on Trip Advisor. Everyone wanted to go, and seeing as there was little else to do (besides sleep), I agreed to go too. We bought matching shirts, drank two for one drinks, and danced to all the hits from 10 years ago until the early morning. The air conditioning of the club didn’t really do much, but it was still a fun evening. After all, I have to be able to say I’ve partied on every continent, right? Just like nights out in every other place I’ve been to, there is always some sort of alcohol-absorbing food that is readily available immediately upon exiting the club. Hue did not disappoint. There was a friendly lady selling delicious Bahn Mi right outside the door, and it made my 2am, 10 minute walk back to the hotel that much more enjoyable . . . and with a wake up call a mere 4 hours away, I needed all the help I could get! 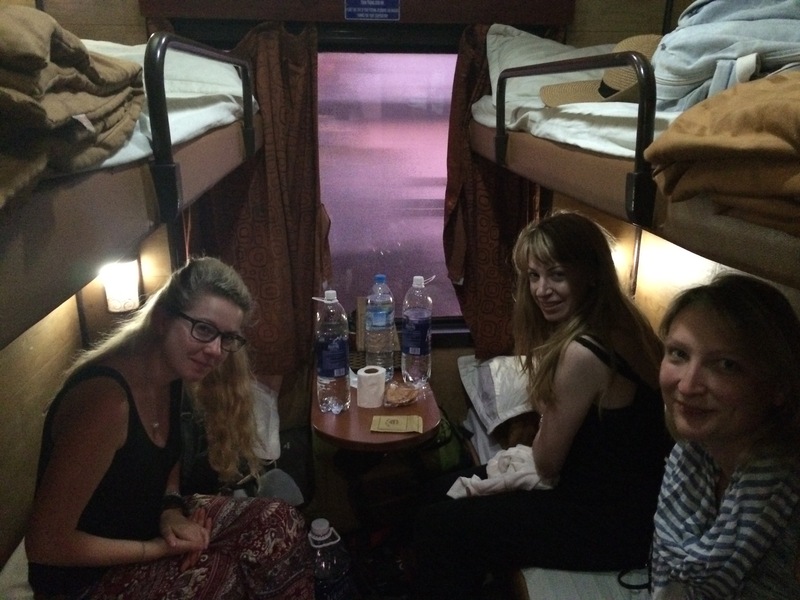 The second night train was easier than the first, and slightly less arctic, so arriving to sticky & humid Hoi An I was less tired than I thought. We checked in and started walking towards the old city, but stopped on the way to rent BIKES!! Yes, we each rented out very own cruisers for the bargain price of 20 000 VND a day ($1 USD/$1.30 CAD – yes, our dollar is that bad right now!). It was pure freedom. My bike had a bell and everything! The joy of being back on a bike, even one without gears, was indescribable. Finally I could get around quickly, covering lots of ground with only a few pushes of the pedals. It was awesome. 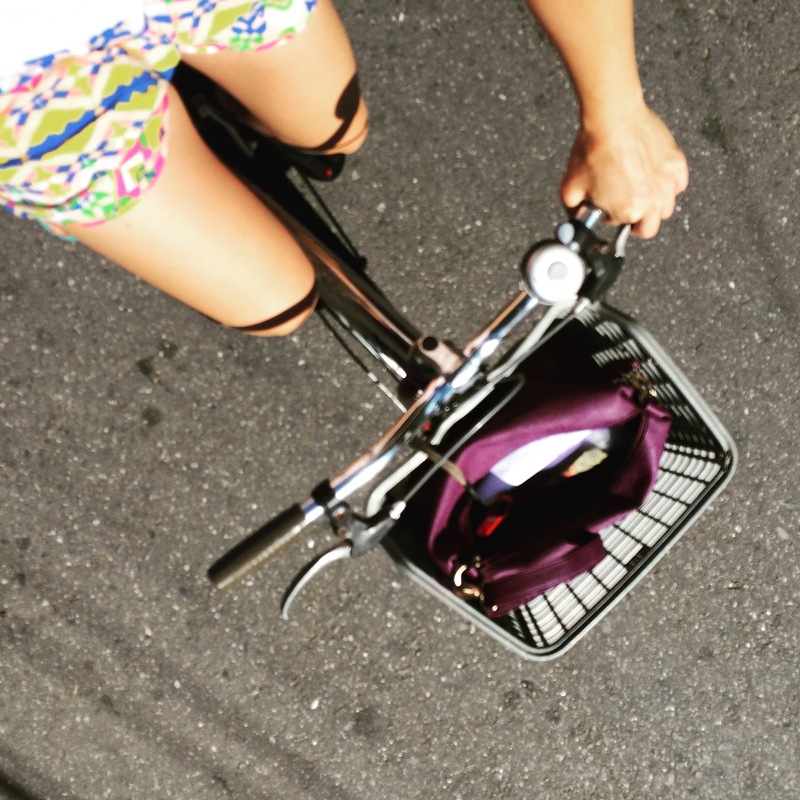 Actually, biking around Hoi An was my favourite part of Hoi An. The old city is beautiful and full of character. Stuffed with tailor shops and temples, riding around looking at the architecture, and trying to navigate the minute but bustling central market was an event in itself. I must have ridden up and down each street three times, just enjoying the view. I must admit I did spend a considerable amount of time shopping . . . I had a few things made, including a pair of Birkenstock-esque sandals, and invested a considerable sum into the Vietnamese economy. The first night our tour leader organized a bike tour through the rice paddies and gardens just outside of town, and we ended up at the beach for dinner and a bonfire. We arrived in Nha Trang at sunrise, dropped our bags at the hotel, and headed for the beach. I rented a lounger and an umbrella for the day (35 000 VND $2.25 CAD) and then lay there all day. That’s it. That’s all I did that day. It was awesome. The next day I went diving!! I booked through Sailing Club Divers and they were awesome. 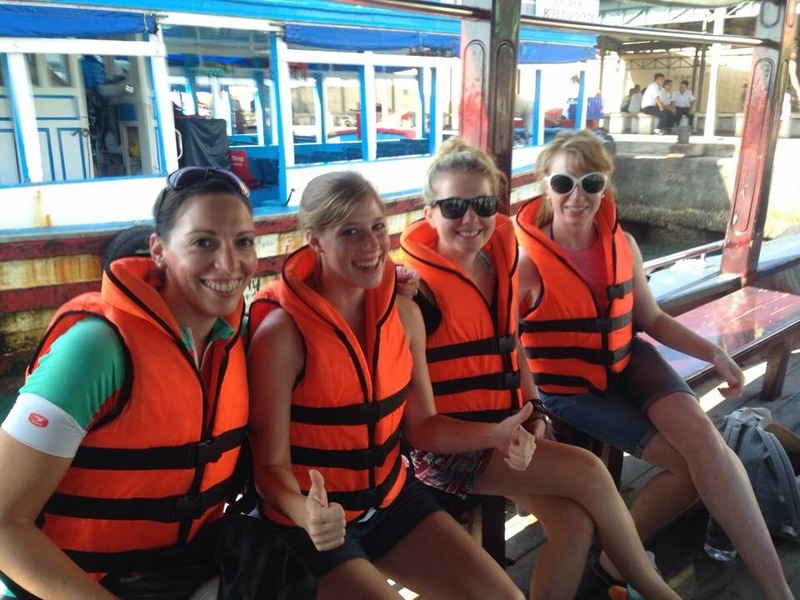 I had convinced Sara and Victoria to try a Discover Scuba, and had given them a mini briefing on the train. 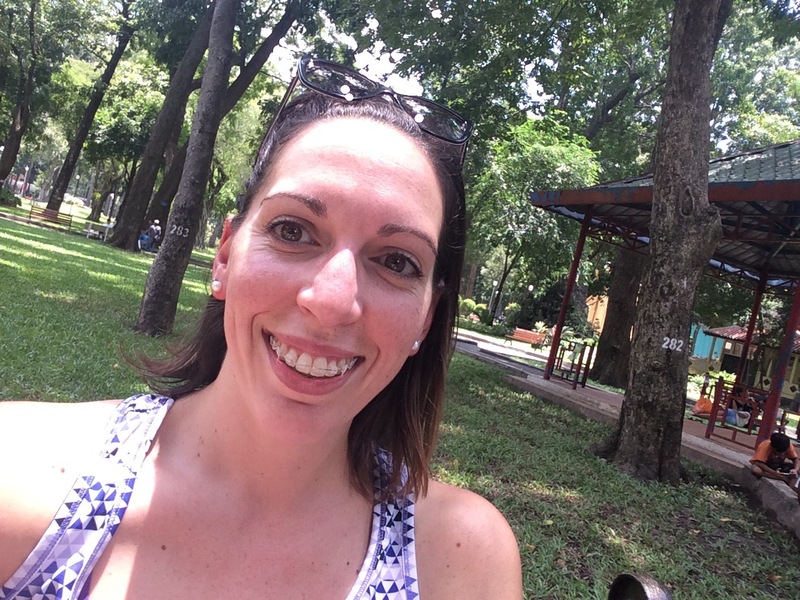 Mirjam thought she couldn’t dive because she didn’t want to do a refresher, but I assured her her dives in the Maldives a year ago were more than enough practice for the shallow warm waters of Vietnam. The four of us were only joined by three other customers and one recently certified DM. Mirjam and I were given guides of our own, and the discovers shared an instructor. 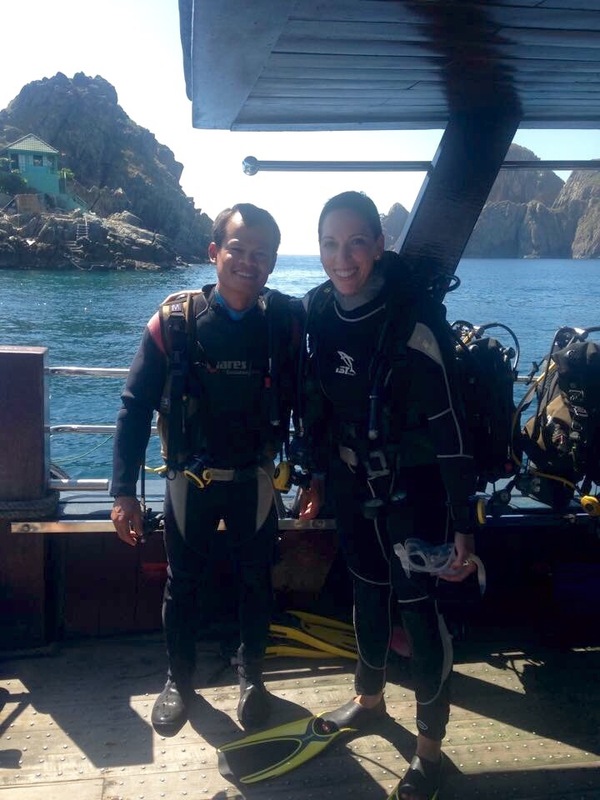 My awesome guide, Khoa, was a staff instructor and understood my desire for a long, slow dive to look for little, rare and beautiful creatures. Both he and the South China Sea did not disappoint! In 125 minutes I saw trumpet fish, razor fish, parrot fish, nudibranchs, sea cucumbers, popcorn shrimp, bubble anemones, butterfly fish, Moorish idols, banded shrimp . . . AND TWO FROGFISH, TWO GHOST PIPEFISH, A JUVENILE SWEETLIPS AND A LEAFY SCORPIONFISH!!!! I also saw a new thing! A Godeffroy’s sea cucumber. It was awesome. I love frog fish; I love them so much. Khoa understood this love and let me look at one for a solid 5 minutes. It was fantastic, and I would highly recommend diving with them. 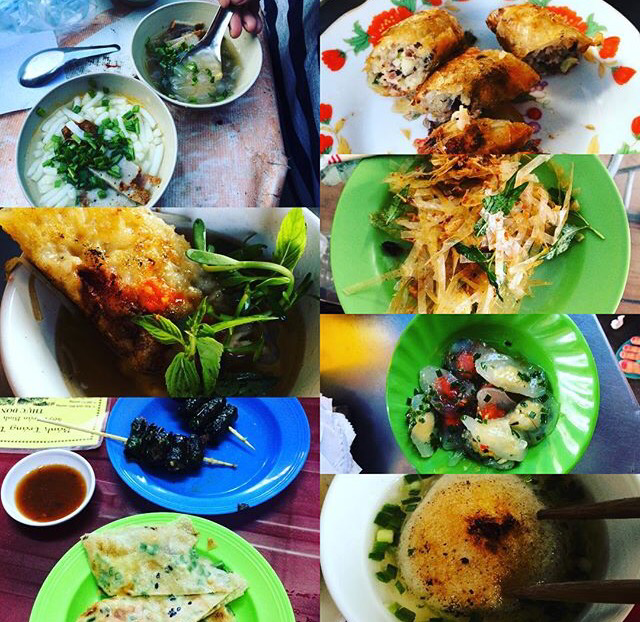 Next up was a street food tour, something I had been looking forward to since booking my trip. 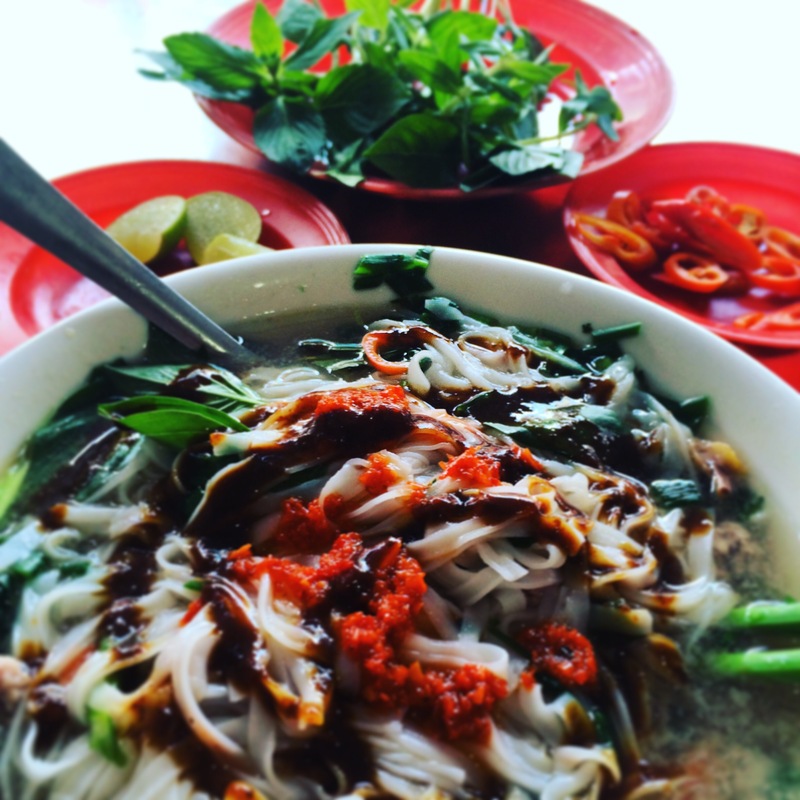 Hayley and I met our guide at 3:45 and proceeded on a whirlwind food tour of Nha Trang. 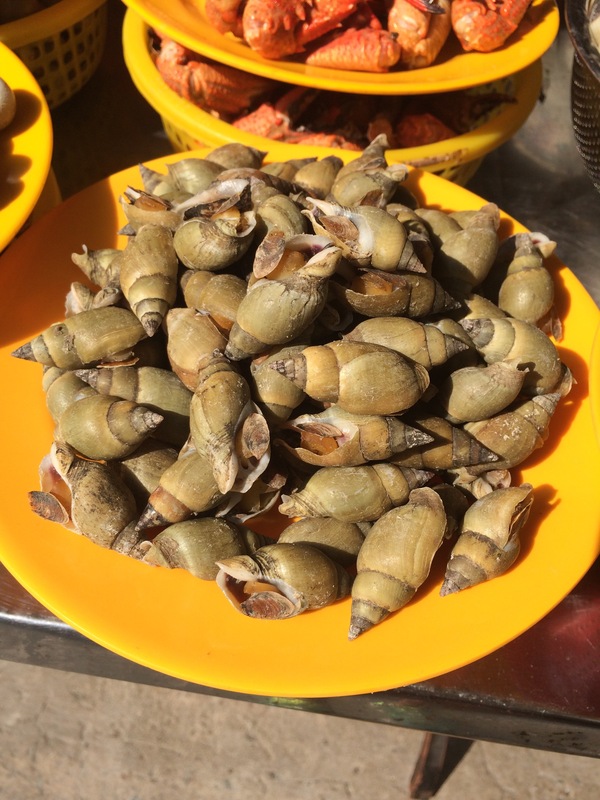 We sampled a bunch of local and nation-wide delicacies, including our favourite Bahn Xeo, a pancake-like thing filled with seafood and dipped in fish sauce. We also tried a bunch of different noodles and some sugar cane juice. 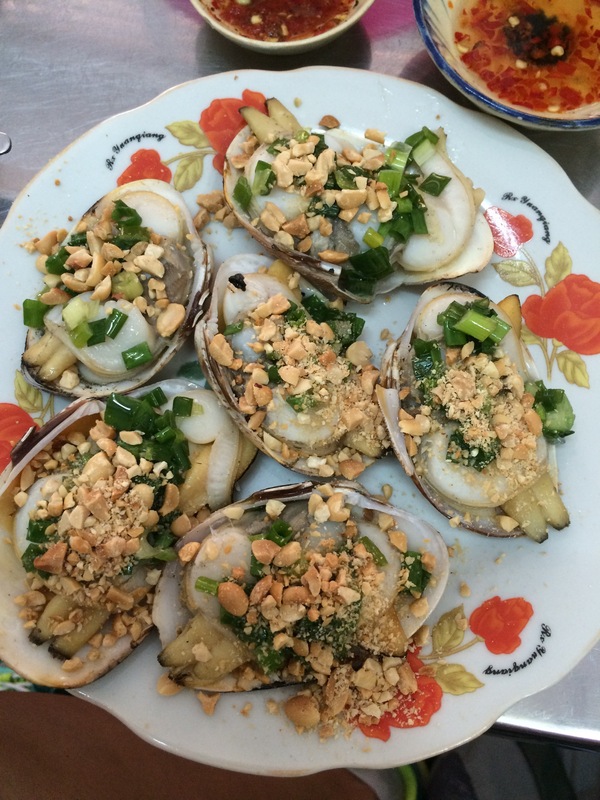 I will write in more detail about what I ate in Vietnam later, to make sure I don’t skip anything! At the end of the tour we walked through the local market at rush hour, and it was crazy! There were people selling meat, fish, shellfish, veggies, fruit and everything else you could imagine, including the kitchen sink! It was well worth the effort to do the food tour, not to mention the 5 lbs I gained. Contented and stuffed, it was back on the train and onwards to Hoi An. 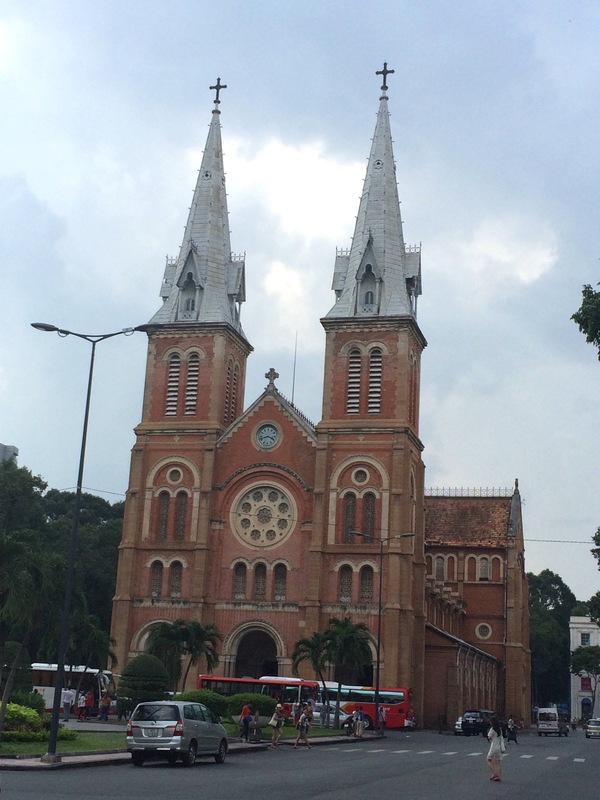 My last day in Ho Chi Minh City was the first day of the tour that I joined for 12 days while here in Vietnam. We had met the night before for introductions and a group dinner at an entirely unappealing restaurant in the backpacker district of Saigon. The streets were busy, thronging with life and music, and while the chosen restaurant was completely devoid of personality, the food was good, though overpriced in relation to the endless delicious street food. 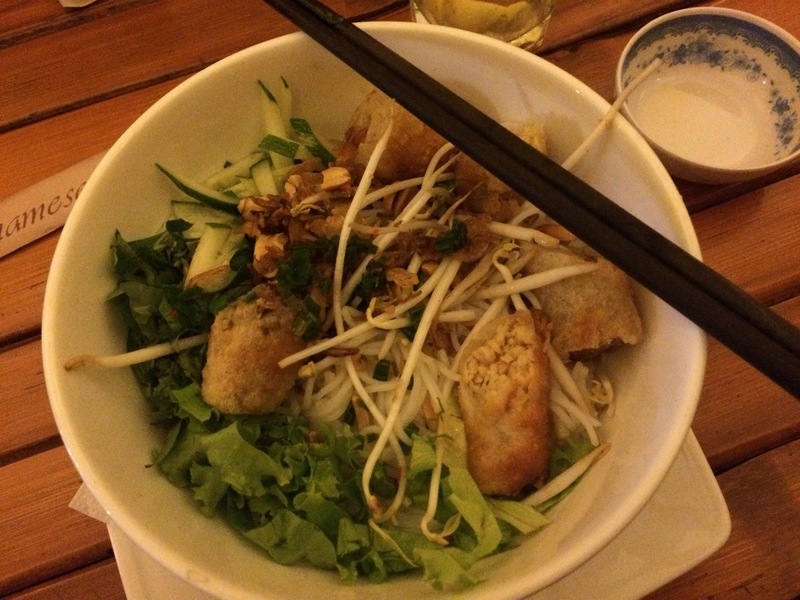 I tried Bun Thit Nuong, which was a delicious mix of a noodles, grilled pork, spring roll and fish sauce. Luckily, the people that I’m travelling with are wonderful. At 8 am we all piled on our bus with The Law, our funny, well-spoken guide for our half day tour to the Cu Chi Tunnels. Though Cu Chi lies only 40 km outside HCMC, it took us a solid 90 minutes to get there. On the way, Law gave us a great, and remarkably unbiased story of the war. The first tunnel was actually constructed in the Indochina War, as a way for the South Vietnamese to hide from the French. Once the Vietnam War started in earnest, the crafty farmers of Cu Chi realized that the tunnels could be their salvation as well as a great guerrilla tactic against the American forces, and they expanded the tunnel system to include over 200 km of tunnels that contained bunkers, kitchens, toilets, wells, medical rooms as well as dead-end traps. 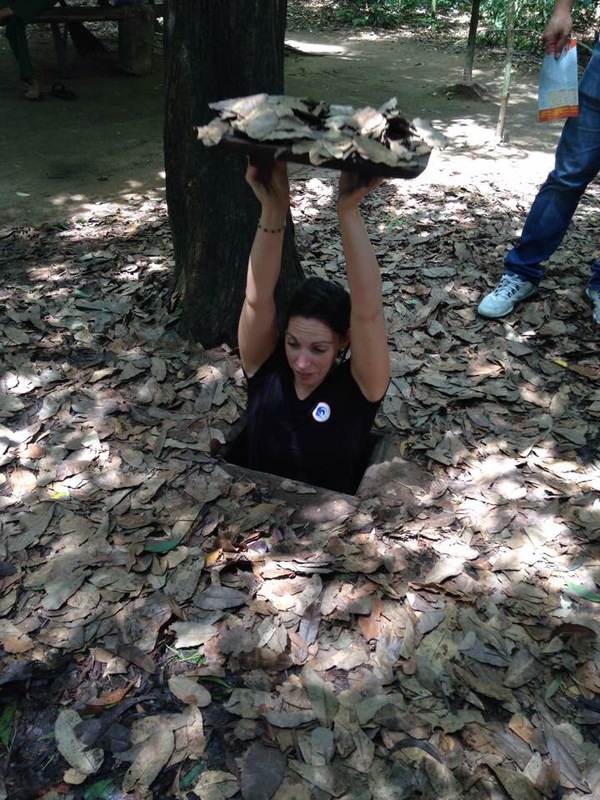 The tunnels of Cu Chi are built into a slight hill in the landscape, and so there are multiple outlets into the Saigon river, handy for flushing out waste and sneaking away. During the war, many farmers of Cu Chi lived double lives, digging the tunnels or fighting at night, and harmlessly farming during the day. Everyone was expected to help dig the tunnels out of the clay-rich soil, and the networks were diverse and complicated intentionally so that any American ‘tunnel rats’, even if they were small enough to fit in the tunnels if they found an entrance, would get hopelessly lost. The amount of ways that were invented to torture the invading Americans were endless and varied, usually involving spikes hidden by trap doors in the dense jungle. The amount of things people think of to torture each other always surprises me. Although it was interesting to see Cu Chi; to see just how small the original openings actually are, how tight the tunnels were, to learn about the way life was lived in the earth, I have to admit that it all felt a bit theme park-ish. 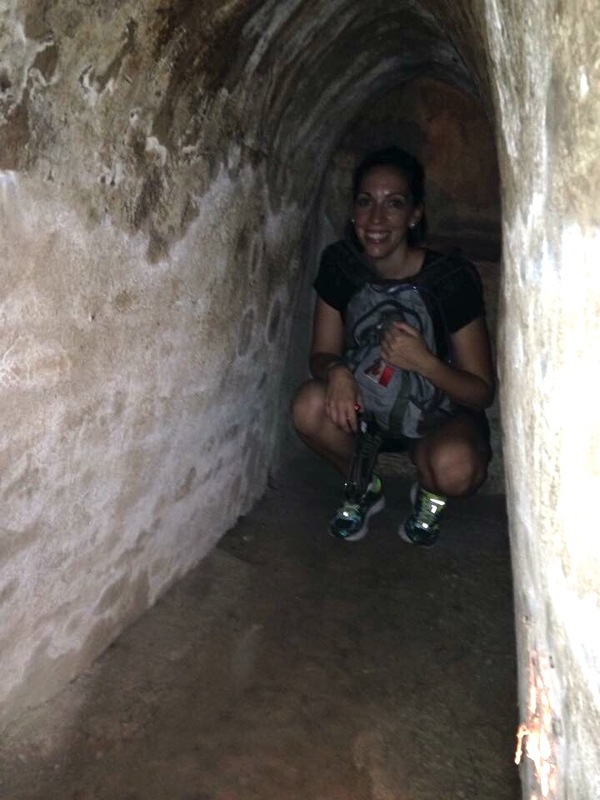 I know that there are other tunnel systems to visit, and that Cu Chi is often chosen for its proximity to Saigon; I would recommend travelling further afield if you have the time. Finally it was time for the night train. If you didn’t know, I love trains, so was quite excited that my itinerary would include five of them in total. Our little cabin was cozy but functional, and four of us settled in for a rickety and supremely air-conditioned ride to Nha Trang. Day two in Hi Chi Minh City was just as bustling and busy as day one. After a decent sleep, I woke up early, had pho and toast for breakfast and set out for what would be an exhausting and rewarding day. 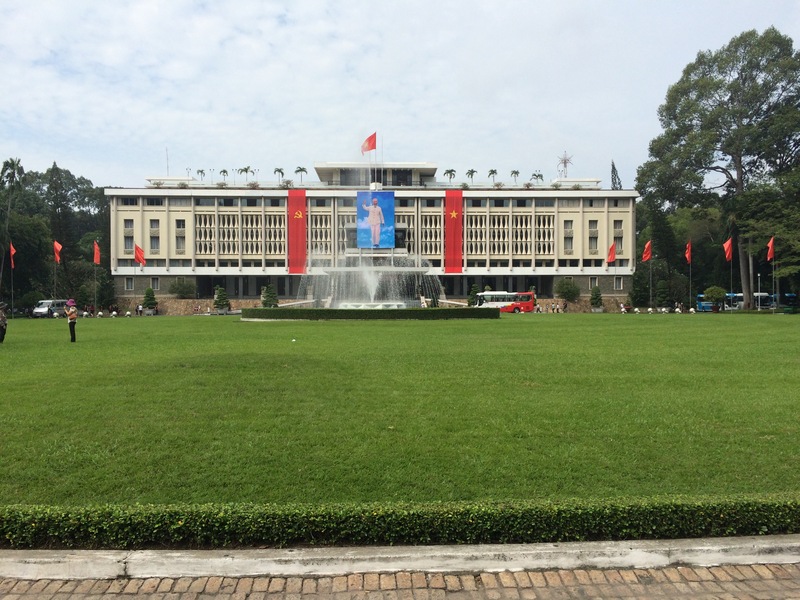 After doing some research and reading the night before, I’d planned to visit the Reunification Palace (also called Independence Palace) and the War Remnants Museum, before going further afield to visit the Jade Pagoda, and maybe more. Walking to the palace, I turned down several offers to hop on scooter tours, but deciding it wouldn’t actually be a half bad idea I stopped to talk to one man. 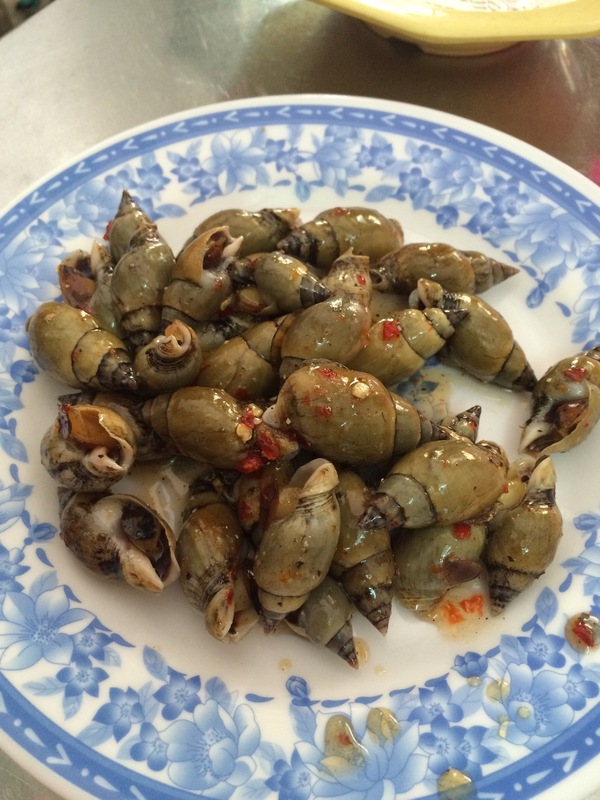 We had a brief chat and discovering the price was only 200 000 VND (about $11.50), I hopped on and we scooted away. My visit to the Reunification/Independence Palace was subdued but powerful. I’d recently watched a documentary about April 30, 1975, and to now be standing on the same ground and walking the same halls where so much recent history happened was quite overwhelming. The final removal of American personsel from Saigon was a dramatic and intense affair, ending with a final declaration of a united (and communist) Vietnam – thirty years after Ho Chi Minh first declared an independent Vietnam to end French, control, and twenty years after America installed itself in the country to attempt to halt the spread of communism. The Palace has been restored to its former 1960s architectural and design glory. The bamboo inspired facade and breezy walkways offer stunning views of the surrounding park and city. The furnishings straight from your grandmothers house, low, sleek and minimalistic, with chandeliers everywhere and a plethora of different wallpapers. The self-guided tour brochure took me around every floor, except the first, which was closed for preparations for Vietnam’s National Day, September 2, marking 70 years of Vietnam’s self-proclaimed independence. There were helpful and informational signs for many rooms, and photos were allowed everywhere. The bunker in the basement was the last floor to visit and was quite startling in its maintained detail. Desks, chairs, phones and a ton of communication and transmission devices filled the rooms, even wartime maps of Vietnam, showing areas of involvement and the Ho Chi Minh Trail. It was definitely an eye opening glimpse into the past. My next stop was the War Remnants museum. I think it used to be called the War Crimes museum, but the Vietnamese, in their seemingly unending spirit of forgiveness and acceptance, renamed it to reflect that the war is in the past. Starting on the third floor and working my way down, the few hours I spent looking at pictures and reading captions were pretty heavy. Starting with the end of French rule in 1945, the museum systematically chronicled the next 30 years of war in Vietnam. As is the case with any national war museum, the story is told from the perspective of the country who’s soil you’re standing in. That said, it’s pretty difficult to rationalize American, French, Cambodian, Korean, Australian and New Zealand’s roles in what started out as a civil war. 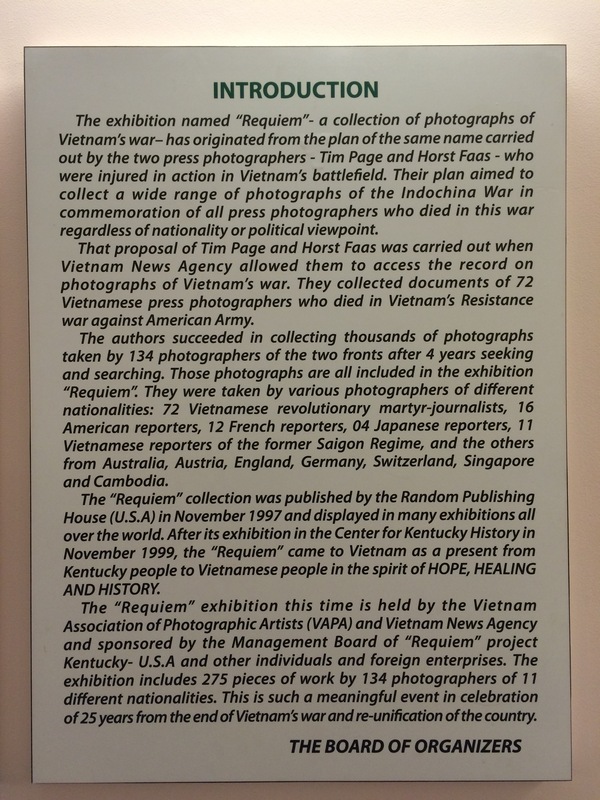 Probably my favourite display, if one can favour an atrocity, was the second display, ‘Requiem’, a “collection of war documentary photos taken by 134 journalists from 11 countries, killed during the Indochina War”. The photographs are remarkable; sharing all sides of the conflict in black, white and colour. It’s really difficult to put into words how I felt, and still feel about this exhibit, and my experience at the museum in general. I did make a concerted effort, however, to look at every picture and read every caption; I figured it’s the least I could do for the privilege of being able to visit Vietnam. Somewhat luckily for me, the museum closed for lunch before I had a chance to see the remaining floors. I got to take a break and a bit of a breather and explore further afield from the city centre. I headed next to the Jade Pagoda, and to be honest it was a bit of a let down. Very basic, and crammed between more modern buildings, it wasn’t particularly worth the trip, though whizzing around Saigon on the back of a scooter was pretty awesome. I stopped for lunch (bahn mi and Vietnamese iced coffee) and drove over the Saigon River on a bridge and then back across via the tunnel! Somewhere during lunch I had a discussion with my scooter driver to discover that the price of 200 000 VND was in fact only for a portion of the day, and so had to hastily renegotiate a deal to avoid getting even more gouged. I rarely fall victim to these types of scams, but it happens now and again – doh! I arrived back at the museum and tackled the other exhibits, particularly the war crimes: imprisonment and Agent Orange. I won’t go into much detail, but will mention that a visit to the museum is a worthwhile way to spend half a day. Actually the stall was full of all sorts of delicious looking sea creatures, and I knew it was time for second lunch. The two women who ran the little restaurant did not speak any English, my Vietnamese is limited to a garbled three words; I still made it clear that I desired to taste whatever it was that they were making, and laughing, they say me down at a table, and cooked me the delicious things I had pointed at, and showed me how to eat them. This scrumptious meal cost a whopping $4 CAD. 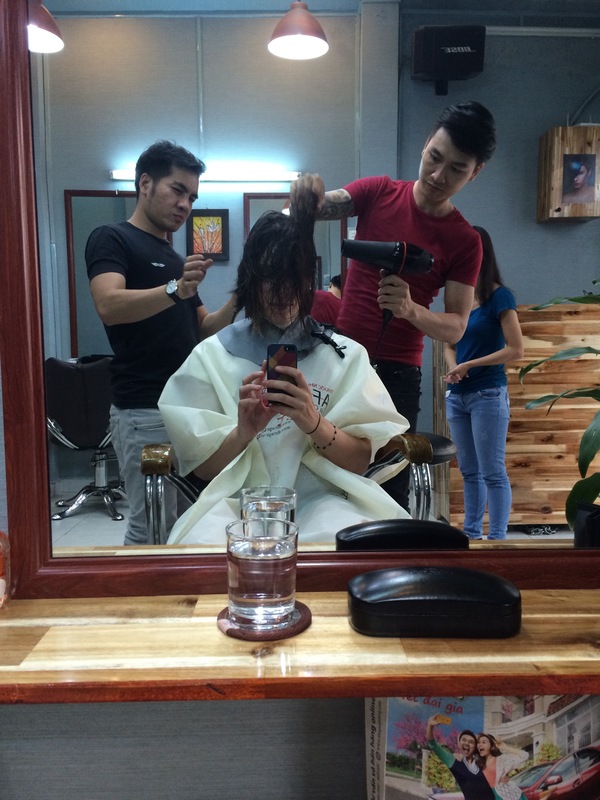 As I was enjoying, I espoused across the street a hair salon, and inquired as to the cost of a cut: 100 000 VND or less than $6 CAD. Even if they messed it up, at least my hair would be short again. 45 min and an incredible haircut later, I posed with my awesome new stylist and hit the street again, ready and revived to tackle more of Ho Chi Minh City. Within 2 hours of arriving in Vietnam, I was enjoying a bowl of pho at a restaurant frequented by Anthony Bourdain and packed with locals. 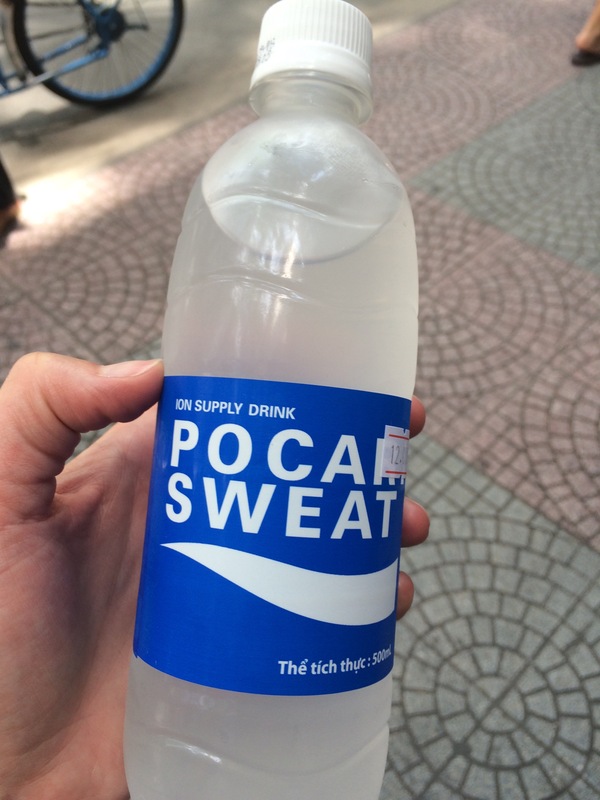 I had dropped my bag off at my hotel and was told I couldn’t get into my room for another 3 hours, so I stopped to purchase my favourite electrolyte drink of all time, Pocari Sweat, and headed to the little park across the street. Asking some locals where this pho restaurant was that I desperately wanted to visit, I was told that at 2km away, it was too far to walk. With time to kill, two feet, a heartbeat, and pho in my future, I set off and was handsomely rewarded for my efforts. 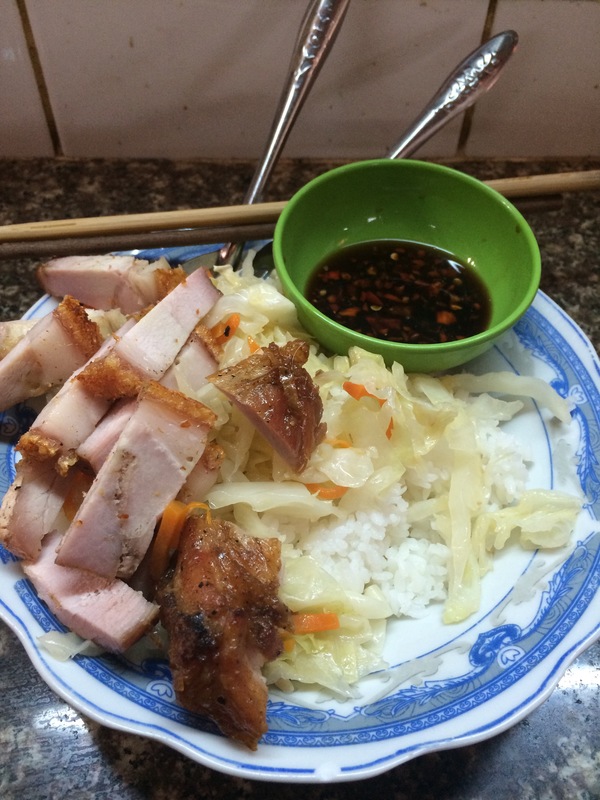 30 000 VND ($2.10 CAD) and some happy slurping later, my goal for Day 1 in Vietnam was complete. Feeling refreshed and energized by the hot air, warm breezes, palm trees and general bustle of the city; a stupid happy grin plastered to my face at being returned to my natural habitat of chaos, I kept wandering and found myself in the old French part of the city, with the Post Office and Notre Dame Cathedral both looking resplendent in the midday sun. Standing in front of the cathedral, I was suddenly a celebrity. A giant in Vietnam at 5’7″, two separate groups of Vietnamese kids (in their late teens I would say) asked to have their pictures taken with me. The second group decided to friendly kidnap me, and made it their mission for the next couple of hours to be my friends. 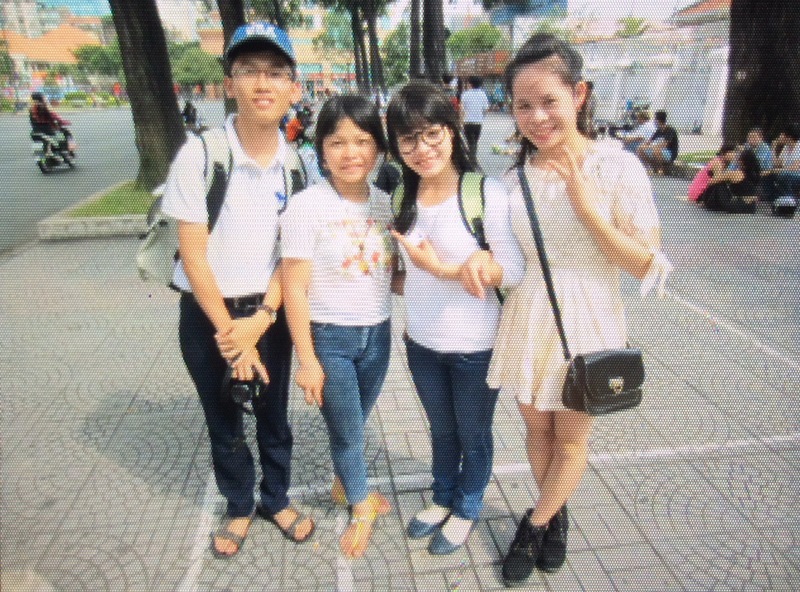 We talked, I helped them say ‘bookstore’ properly, they helped me learn a few words in Vietnamese. We shared fruit they had with them and they bought some drinks for us to share. One of them serenaded me with a song, I reciprocated by singing along in English to the music on their phone. They even bought me a bracelet, as a reminder of our afternoon!!! After our goodbye, with promises to keep in touch, it was time for this tired traveller to head back and get some rest. A much needed shower and a quick foray to grab some steam buns and Tiger beer for a take away dinner, bed time was 8pm last night. Still exhausted, I feel refreshed, invigorated and more alive than I have in months…the desire to explore and experience the new and different stronger than ever before. 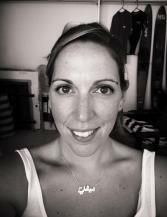 These three weeks will be fleeting, a reminder of a past life, so I better get out and get going!